The South Dakota Retailers Association is Getting Down To Business across South Dakota. Read featured articles or watch a YouTube video sharing how businesses in South Dakota are using the abilities of individuals with disabilities to improve their organization. A Business Resource Guide developed through a partnership of the South Dakota Division of Rehabilitation Services and the South Dakota Retailers Association contains helpful information for businesses recruiting, hiring and maintaining employees with disabilities. Ability for Hire is a South Dakota movement about changing perceptions. It's about seeing the ability in a person instead of the disability. When you do, the possibilities are endless. Share this message with someone you know today. Learn, through Ability for Hire YouTube videos, how other businesses in South Dakota are taking advantage of the skills employees with disabilities have to offer. 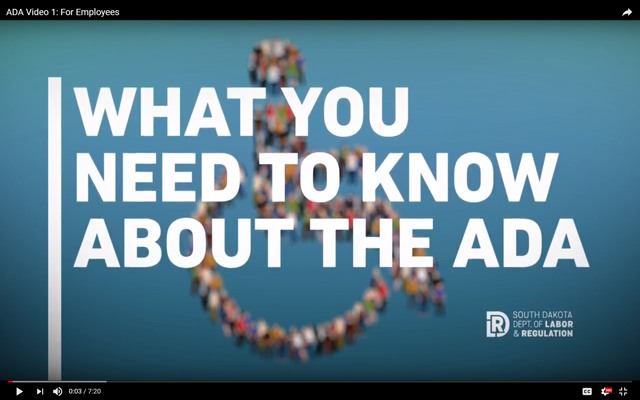 The DLR has released three videos featuring tools and resources to help both employers and employees better understand the ADA. 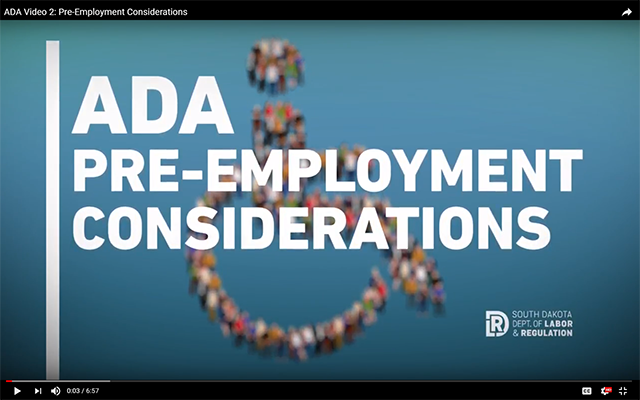 ADA Pre-Employment Considerations shows employers how to improve hiring practices and allow for the inclusion of individuals with disabilities in the applicant pool. It also provides an overview of the ADA and tips on how to abide by the ADA during the hiring process. The Pre-Employment Considerations FAQ fact sheet (Adobe PDF) contains guidance and considerations for pre-employment scenarios. 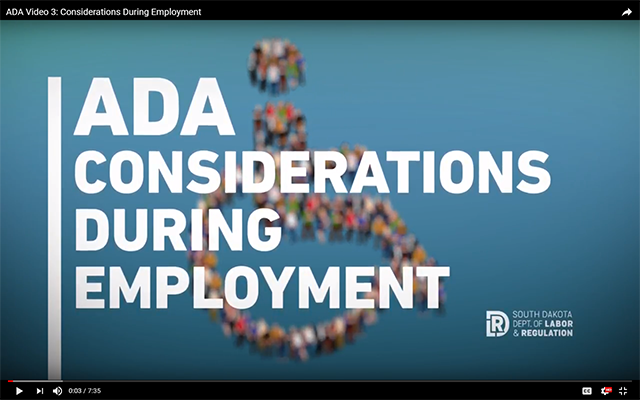 ADA Considerations During Employment features considerations during employment. This essential employer resource reviews how to accommodate and retain new or existing employees with disabilities in accordance to the ADA. The Considerations During Employment FAQ fact sheet (Adobe PDF) contains guidance and considerations for scenarios during employment.